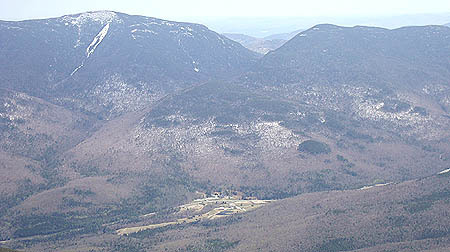 A northern subpeak of Wildcat Mountain, Little Wildcat Mountain is located behind the Glen House off Route 16. At least three alpine ski trails were cut in the 1930s, however none of them appear to have survived World War II. Perhaps the most gradual of the three main Little Wildcat trails, the Go-Back Ski Trail traversed across the lower western slope. The direct route from Little Wildcat to the Glen House, the Katzensteig Ski Trail was considered the most challenging of the three main trails on Little Wildcat. The Wildcat Col Trail had less vertical and pitch than the nearby Katzensteig Ski Trail.
" Go-Back Ski Trail. 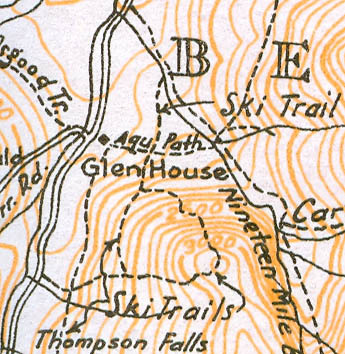 This trail extends E. and S., up-grade, from Pinkham Notch Road at the top of the hill near Nineteen-Mile Brook bridge 1 m. N. of the Glen House, to a point on the Wildcat Col Ski Trail about 0.9 m. from Pinkham Notch Road, crossing at 1 m. and 1 1/2 m. respectively from its N. end, the Aqueduct Path and the Katzensteig Ski Trail. This trail is a wood-road 2.2 m. long, rising 800 ft. It is suitable for all classes of skiers when covered with 8 or 10 inches of snow. Time: ascending 1 1/2 hrs., descending 1 hr. " " Katzensteig Ski Trail. 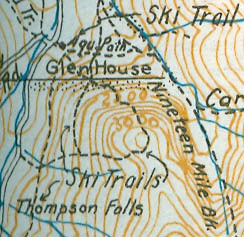 This trail extends from a point immediately back of the Glen House S.E. to the summit of Little Wildcat Mt., where it joins the Wildcat Col Ski Trail. About 0.3 m. from the Glen House it crosses the Go-Back Ski Trail. Its lower end is a wood-road and its upper part is 15 to 50 ft. wide. It requires 12 inches of packed snow, is 1.3 m. long and rises 1,640 ft. It is for expert skiers only. Time: ascending 2 hrs., descending 15 min. " " Wildcat Col Ski Trail. This Trail extends from a point on the E. side of Pinkham Notch Road 2 m. N. of Pinkham Notch Camp and 1 m. S. of the Glen House to a point on the Katzensteig Ski Trail on Little Wildcat Mt. about 1.9 m. E. It crosses the Pinkham Notch Ski Trail about 1/4 m. from the road. At a point 0.9 m. from the road the Wildcat Col Ski Trail turns up to the R., while the Go-Back Ski Trail continues straight ahead. This trail requires 10 inches of packed snow and is suitable for intermediate and expert skiers. It rises 1,580 ft. The lower portion is a wood-road, the balance a trail 15 to 30 ft. wide. Time: ascending 1 hr., descending 20 min. " 1. Location - Start either from H. 16 about .5 mi. S. of Glen House, from Aqueduct Path or from Katzensteig Trail. Connects with Wildcat Col Trail and hence to summit of Little Wildcat Mt. 4. Max. Grade - About 11º. 6. Exposure - N. 10" snow. 7. Very easy novice trail. " 1. 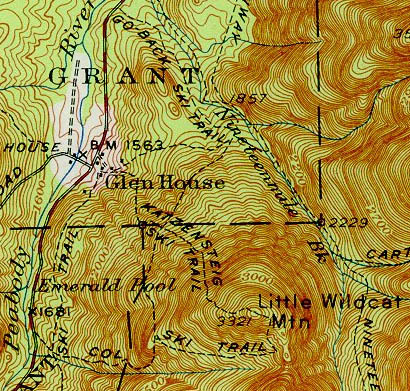 Location - Starts behind Glen House and goes to summit of Little Wildcat Mt. 2. Length - 1.3 mi. 6. Exposure - N.W. 20" snow. 7. Lower .25 mi. is for the intermediate skier and the rest is suitable for the advanced. " 2. Length - 1.9 mi. 5. Vertical Drop - 1500'. 6. Exposure - W. 18" snow. 7. Intermediate trail linking with the Katzensteig Trail at the summit of Little Wildcat Mt. " " Go-Back Trail (W.M.N.F.). Start either from State 16 about 1 m. N. of Glen House, from Aqueduct Path, or from Katzensteig Trail. Connects with Wildcat Col Trail, and thence to summit of Little Wildcat Mt. Length 2.2 m. Max grade about 11º. Very easy novice trail. " " Katzensteig Trail (W.M.N.F.). 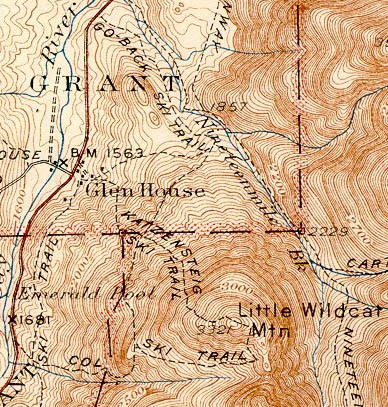 Starts behind Glen House and goes to summit of Little wildcat Mt. Length 1.3 m. Max grade 28º. Lower 0.25 m. is for the intermediate skier, and the rest is suitable for the advanced. " " Wildcat Col Trail (W.M.N.F.). Runs E. from State 16 about 1 m. S. of Glen House. Length 1.9 m. Max. grade 26º. Intermediate trail linking with the Katzensteig Trail at summit of Little Wildcat Mt. " " Katzensteig Ski Trail. This Trail extends from a point immediately back of the Glen House SE to the summit of Little Wildcat Mtn. Its lower end is a wood-road and its upper part is 15 to 50 ft. wide. Distance 1.3 m. "